With the launch of Beats Music today the new music streaming service will join the already long list of music streaming services available for users and to be honest we’re spoilt for choice when it comes to choosing one. From Deezer to Napster to Spotify all the way to Beats Music each service has its differences and some are better than others, so if you’re a music lover and you own a smartphone then this list will help you pick the best music streaming service. So lets explore your options. Spotify is one of the worlds best known music streaming service and with a catalog of over 20 million songs it offers it users a wide variety of genres and artists, and with the inclusion of third party apps such as the BBC Playlister service, there’s always much more to extend your listening experience. Most people use Spotify to listen to individual bands or artists, to create a playlist of their favorite tracks or just to listen to an individual album. Spotify also offers a radio option that will randomly select artists and songs based on your original artist of choice, this is nice feature for people who like to discover new music which at the same time is very similar to the music they already listen too. Admittedly its not the smartest radio out there and there are better options to keep in mind. In Spotify’s most basic form, streaming music is free on all platforms, although depending on which device you’re using you will either get the option to only play songs on shuffle or the occasional ad in-between songs. A few months a go Spotify used to charge for mobile access, but its recent changes has scrapped that feature and they’ve also removed the 10 hour listening limit for people with free accounts in some parts of Europe, in a hope to make it more accessible for people who don’t want to pay a subscription. At first glance you expect iTunes Radio to be a big player in the music streaming business, down to the fact that its tied to the biggest digital music store in the world, and it is. Offering access from a range of Apple devices, iTunes Radio can be used on your iPhone, iPad, iPod Touch, Mac, Apple TV and your trusty PC while at the same time offering seamless syncing of your playlists between all your devices. What iTunes Radio does differently to all the other music streaming services is, it focuses on offering users a choice of more than 250 human curated and genre focused radio stations, as opposed to letting users create their own playlists, like many other services. But if none of those 250 take your fancy then you can always create your own station based around any song, artist or genre. See Also: What is iTunes Radio? The downside of iTunes Radio is that since its release last September in the US, it doesn’t seem to be coming available anywhere else any time soon, so for now, only people in the US can enjoy iTunes Radio. There’s also a $24.99 a year fee for a premium subscription , but if you don’t mind the occasional advert and you can live without the iTunes Match service, then you should be fine with the free version. iTunes radio main reason for being Number 2 is its integration into the iOS and Mac platform and the huge variety of songs since all songs available on iTunes can be played on iTunes Radio. Beats Music is the newest service on this list as it actually releases today (21st January 2014) for users in the US, although further expansion is expected as it allows people from outside the US to still sign up and reserve their username. The service is being back by Dr Dre, hence the name Beats Music as its next venture in the music business by creating the next big music streaming service. Beats Music will also boast a catalog of over 20 million songs, the same as Spotify who will most likely be the sites main rival, it will launch on iOS, Android and Windows Phones, as well as being available online. Beats Music aims to take streaming music to a new level because instead of just choosing specific tracks, it seems like Beats Music users will generate a playlist by using cues from the real world, including people, locations and activities and genre. So if you’re looking for a context smart streaming service the Beats Music is what you’re looking for. Unfortunately Beats Music will not being offering any kind of free service, instead it will cost $10 a month and that’s it, you will be able to test the service for 30 days with a free trial though to see if you like it. 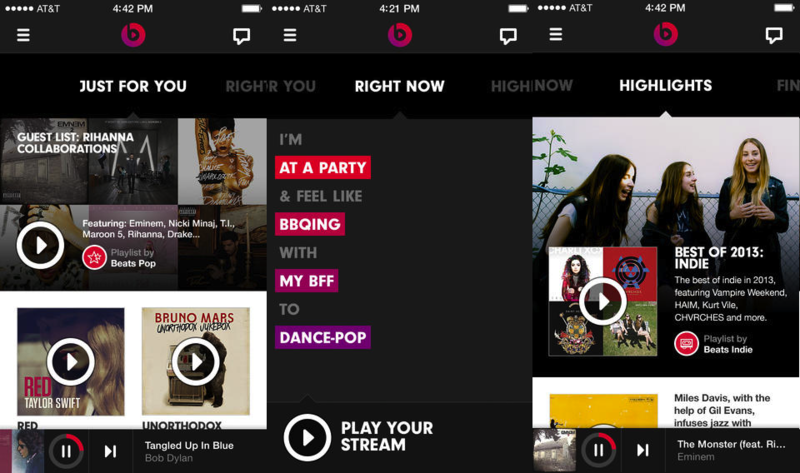 Leave a comment on what your favorite music streaming service is and will you be using the new Beats Music?